Home › Promotions › 10% OFF ALL LICENSED BLING! 10% OFF ALL LICENSED BLING! Dallas Valentine's Day Gift Idea! February is your time to shine! 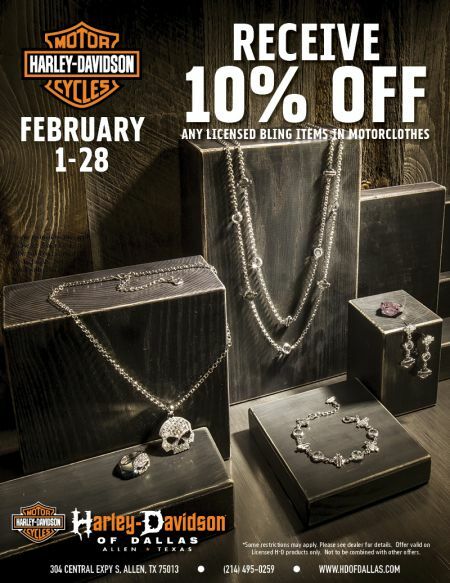 Take an additional 10% off of all licensed bling and accessories! Get to Harley-Davidson® of Dallas in Allen, Texas before someone else buys the one you really want! No through February 28. *Some restrictions may apply. Please see dealer for details. Not to be combined with other offers.